Mix coconut flour, sugar, baking powder, egg and milk in a small bowl. Grease or spray a small mug or jar and pour batter in. Microwave on full power for about 1:30-2:00. Slide it out of container and onto a plate–there’s your cake part! 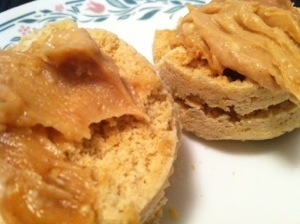 Posted on July 29, 2013 July 29, 2013 by Olivia FecteauPosted in foodTagged cake, dessert, food, gluten-free, peanut butter, yummy.